Before you can place perfect art piece at your desired location, there is something still missing. The finishing touch left is framing. 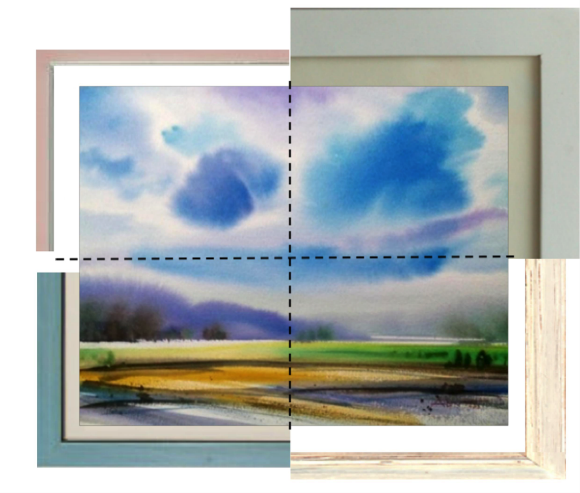 Framing is a short yet crucial process which allows the art piece to either be accentuated, or diminished. Here are a few tips that will pave the way to the perfect frame. Depends. Commonly, works of contemporary art are not meant to be framed, but to each their own. The main point to remember is that the art piece has to be the centre of attention, not the frame. Gallery wrap as seen below is a method of displaying art wrapped over thick wooden bars so that there are no visible fasteners (like staples), and has an image that appears on the sides of the frame as well. This method of preparing a canvas allows for a frame-less presentation of the finished painting in a 3D effect which is achieved when people view it from the sides. 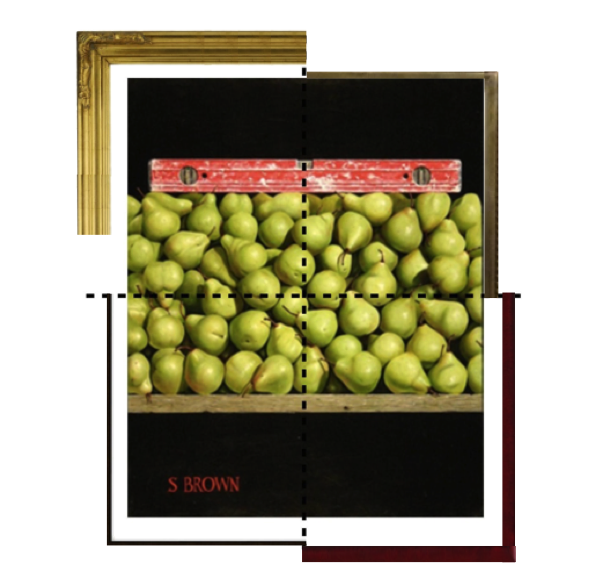 Paintings on board or panel usually require the structure of framing as seen below. An alternate to framing would be box mounting the work. This creates a sleek effect that is pleasant to the eyes. Well, it depends on what the painting is and the medium used to make the piece. Let’s look at the categories of paintings by the subject matter. Featured below is a piece "Level Pears" from one of our artists, Stewart Brown. For images that are clean and don’t have many items, be bold with an ornate gold frame. Add a mat in between the frame and the painting to give a more sophisticated feel. If there is one object that stands out, pick a metallic frame in that shade. Especially for paintings with a dark single tone background, a metal or lacquer frame would bring out the focal object more. Adding a thicker mat helps the object stand out further. For crisp images, darker shades of brown are perfect like chocolate brown. Don’t think about trying to fuse the colors of the furniture in the room into the frame – they are independent of each other. Add a white mat to allow for more focus on the piece. Featured below is "Seascape" from one of our artists, Alejandro Urag. Landscapes are assumed to be more traditional, so you can spice it up by adding a shiny frame with the right color. Silver is a safe color, and even contrasting colors like pink here will bring out the colors of the piece. Add mat for greater emphasis. Playing with different mat colors can pay off. Darker shades of matt help calm the entire piece and this is especially useful for paintings with rough elements of nature. 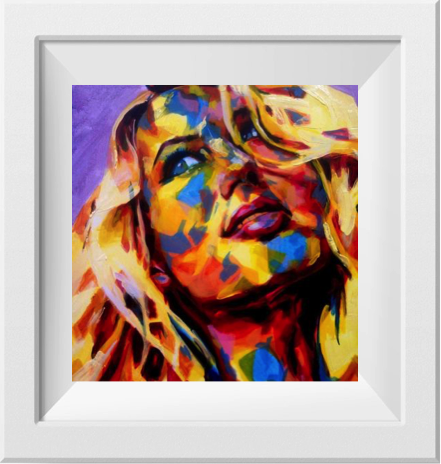 To make the piece pop more you can opt for a white frame. The use of wood makes landscape pictures come to life. There is an element of cohesiveness that strengthens the presence of nature. Whitewashed wood like above is more suited for calm images, and rich toned wood would be more apt for woodier images. Keeping it simple works too. Just choose a color that complements the image, and make use of the different textures of materials (like wood, plastic etc) that are inspired from the piece. For example, the gentle clouds can be accompanied by a smooth blue frame, and for waves, grooves similar to waves can be used. Featured below are pieces from our artists, "The Model" by Brad Swiney and "Father and Child" by Raquel Faustinorio respectively. 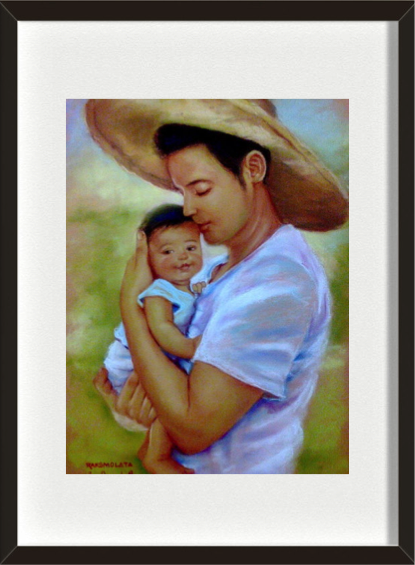 For portraits that are very vibrant and involve a lot of colors, make the frame crisp, clean white with a white or black mat for company. This allows the main focus to be that of the person portrayed. For pieces that are more toned down, not as bright on the eye, a simple black frame with white mat would be perfect. The attention will be directed straight towards the middle, where the piece is located. Just remember that the art piece is the star of the show, and the frame is the backstage crew. Both need to work in harmony. Don’t be afraid to experiment with different colored mats, frames, and even textures. A quick test would be to imagine the piece in the frame, look away, and take a quick glance at the piece. If you are distracted by the frame, it’s not the right one. If you centre your attention at the piece and feel like the entire ensemble with the frame goes well, you have found the perfect frame! Hope these tips help you find the frame which best complements your art.